The Medjugorje Screensaver can be downloaded and used free of charge. It contains photos from section Pictures & Photos taken by Marek Gayer in Medjugorje and also contains selected music tracks from a music album Gospa Oratorio. You can also freely listen to or download the full music album in mp3 format at Gospa Oratorio website and burn your own CD or listen on your MP3 player. As of 24. december 2008, a new version 2.0 is available. It doubles the amount of photos from Medjugorje to 750 and comes with a new background. Note: Older version of Medjugorje Screensaver, 1.0 is also available, here (81.2 MB ) . 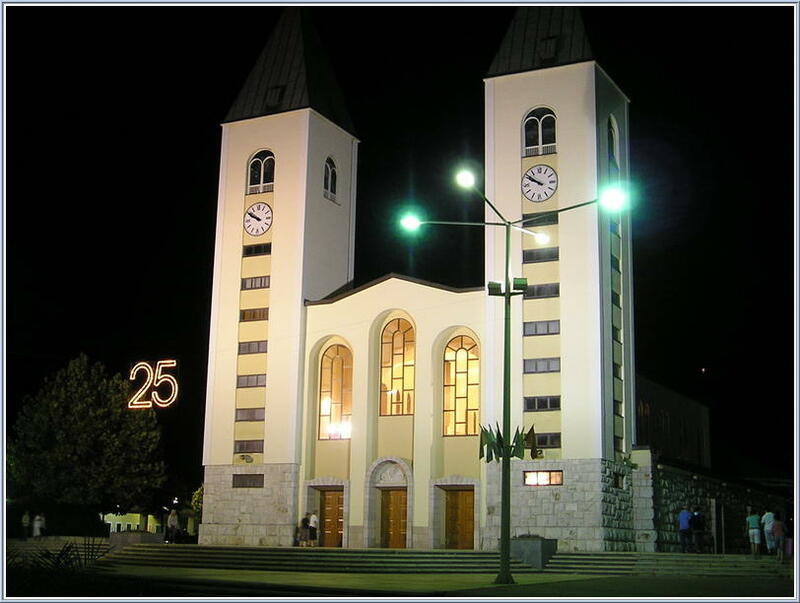 "I recently went to Medjugorje for the first time and all my pictures I took were wiped out going through the airport so this site is a real BLESSING! I took over 1000 photo's when we were there in early November and only 137 actually came out and those were the ones that were still in my camera and back pack. The ones in the checked luggage were all deleted from the memory cards. I was SOOOOOOOOO upset and was so THRILLED to find you site it was like a miracle finding it as most were of photo's I had taken that I don't have now. I am not very computer wise and want to make these photo's into a screen saver can you tell me in simple terms how to do that?? I would be forever gratful!" "I have been sitting in front of my computer for the past hour with tears running down my face as I watch with such a grateful heart the most beautiful Christmas gift I could ever receive. There are NO words to tell you how much I appreciate what you have done, I can't even begin to tell you! A little background first! I was raised a Catholic and went from grade one through high school in a Catholic school but was not a practicing Catholic for many years.................................until Medjugorje came into my life! It happened in a crazy twist of fate (the Lord's way) A lady came into the store where I am manager (jewelry store) and needed her wedding ring repaired before she went on a trip. I asked her where she was going and she said Bosnia and I said "What on earth for?" She then in capsule form told me about Medjugorje. She had had five cancer surgeries in the past year and had been to Medjugorje four times in the past seven years and was going again. (this was a year ago she came into my store) We talked for a while and I remembered the stories of Fatima and Lourdes and she told me this was still happening daily in Medjugorje. She offered to drop off some books to me before she went. They were Wayne Weible's books and I read and re-read them. (Met him there!) I was truly touched. When she came back she came into the store and gave me a rosary and another book. We kept in touch and one day about this time of year last year she came in and told me they were putting another group together to go back. Jokingly she said I should think of going. I have my own business where I coordinate and plan weddings on Mackinac Island here in Michigan in the U.S.A. I told her if I got a couple of good size weddings I would consider it for MYSELF. Two weeks later I had two new weddings on the schedule that gave me the funds for myself to go. Then my husband decided he wanted to go. That is a whole other story. My husband has many health issues and we were worried that this might not be the thing for him to do but we decided to put it in Mary's hands and put our trust in her and her son to take care of us. And boy did they!!!!! My husband was not a Catholic or any specific religion but has been searching for 15 years for something that he FINALLY found in Medjugorje and it has changed both our lives completely. The blessing that have come to us as a direct result of this "happening" for the lack of another word is undescribable. We want to go back so bad and pray on it daily that we will be able to go again in the fall of 2007 when it is cool and most piligrims are gone. We were there from October 30 through November 10 of this year. This gift you have given us will allow us to visit many times daily. I spend about an hour before work in meditation and pray in my office here at home now in front of this blessing and again in the evening as we say the rosary together. Do you have any idea what this means to us? I don't know about anything "negative" about Medjugorje as we saw only positive things and people but it was our first trip. Others with our group have been there as many as eight times and they were all happy pilgrims too! I have never met such wonderful people and so trusting. (that is a whole other story!) We stayed at Hotel Ruza as the man who has put this together for the last ten years has a relationship with the owners by now. We were concerned about "no TV's no internet, no phones etc but I can honestly say we never missed them! Again the blessings were remarkable. I am going to go back into the few photo's I have that I took the last day and send them too you let me know if you get them. Please stay in touch. By the way where are you and what do you do? My husband and I are eternally blessed by your works and will add you to our prayers for the great sharing! Now I want to go and down load this blessing on a CD so I don't ever lose it! Your friends in Michigan, U.S.A. I am very glad that you felt such joy. It did not occur in my mind that someone could feel these photos such a blessing, like as „most a beautiful Christmas gift I could ever receive“. When I was in recent weeks contemplating about spiritual matters, I came to conclusion, that when we succeed in making another person to feel such as level of joy, that such person cries of joy, then it is one of best services one can do for the God. I firmly believe, in a manner similar to Mother Theresa, that God - or Jesus Christ, if you want, is present in a special way in each of human persons, regardless if one is aware of that or not (what in reality is a cause of most problems here on Earth). (see also this annual message for Mirjana from March 18). It is important to note that both the donator and the donee are graced, because the donee experienced grace of joy or service, and the donator was graced by opportunity to serve the God, which is also dwelling in our neighbors. And both the individuals enjoyed the love and joy, which is the pure divine identity of the God, the Creator. On my last pilgrimage in Medjugorje I felt very little presence of God, because I were most of these 4 days concentrating on making good photos, so now I am glad to see that from this certain suffering and also some feeling of certain guilt, in the end something useful came out, which is such great joy of you and your husband. You ask me: Do you have any idea what this means to us? Probably partially, but I shall see in detail following my departure from this world. According of conclusions of continuing Near-Death-Experience research from educated professors and doctors from institutes with good sounding names like for instance University of Connecticut, we after our departure shall experience something which could be comprehend as some kind of “movie”. In this “movie”, we will see our actions, from lot of points of view, in different experience of time then here on Earth, including what these actions have done to others including their exact feelings. I also read that the Medjugorje visionary Ivan believes he will see his life “like a movie” after his death. So now you see, what we have done to others, we have done also to ourselves, because we shall experience the fruits of our actions, in a very concrete, precise and realistic way. Therefore it is very important to always effort to act good to others, it creates both our future here on Earth, and if positive, with good intentions, a future in our real home in Heaven. I am glad too hear that Medjugorje resurrected your spiritual practice, as well as your testimony which is kind of nice testimonies about Medjugorje. I would rather recommend you to go there in late spring, or beginning of autumn. It is possible to stay out at the exterior altar with another pilgrims praying rosary from 18oclock evening, which is very spiritual, walk through the village etc., sit on apparition hill and Krizevac. More days you are there better – the most expensive would be for you the flying tickets anyway. I hope that you will not cease praying rosaries together with your husband or perhaps another ardent prayers towards the Heaven (the form is not important, but the love in the heart). I hope that you could partially see illness of your husband also as a gift of God – for you an opportunity for a selfless service, service to God, and growing in love, for him grace of suffering, because suffering opens our hearts and teaches of humility and compassion. I hope that you will consider, whether part of your spiritual path could not be always seeing Jesus Christ in him. It is not so important to be at Medjugorje. You can deeply pray and cry out of love and joy of God as well in your home for free and saved money use for instance in a way, that also others would feel happier and being loved. But it is your free will and as you would badly long to go to Medjugorje, it probably could mean that pilgrimage has still something to offer to your spiritual growth and perhaps could be a calling of your soul, I do not know. God Bless you Barbara, as well as your husband Scott. The Medjugorje.ws as well as myself are here for you.